The Kandy Esala Perahera, one of Sri Lanka’s most famous religious festivals, takes place every year in the hill-capital Kandy, in the full-moon month of Esala coinciding with July/August. Held to seek blessings for a good harvest from the deities, ten days of increasingly frenetic activity culminate in an ancient, awe-inspiring procession that for centuries has drawn religious devotees, and more recently tourists, to Kandy’s narrow hill-streets. Heralded by thousands of Kandyan drummers, a host of majestic elephants, adorned in elaborately embroidered cloaks, are led by the brilliantly caparisoned Maligawa Tusker. Decorated from trunk to toe, he carries a huge canopy that shelters, a replica of the cask containing the Sacred Tooth Relic of the Lord Buddha. 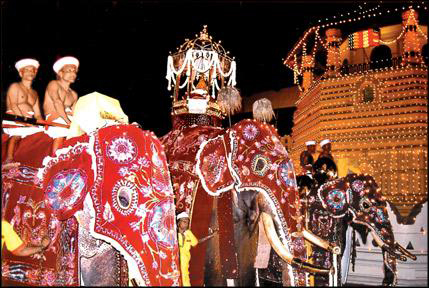 The Esala Perahera actually comprises of five separate Peraheras – four from the Kandy devales (shrines) to the deities – with order of precedence maintained throughout. Led by the Dalada Maligawa Perahera, the second is to Natha, a deity of special importance to Kandy, believed to be Buddha-in-waiting. The third is to Sri Lanka’s Guardian Vishnu, also one of the three great Hindu gods and an important figure in representing the crossover between Hindu and Buddhist beliefs. Fourth and fifth peraheras are from the shrines to god of war and victory Katharagama, and goddess of chastity Pattini.